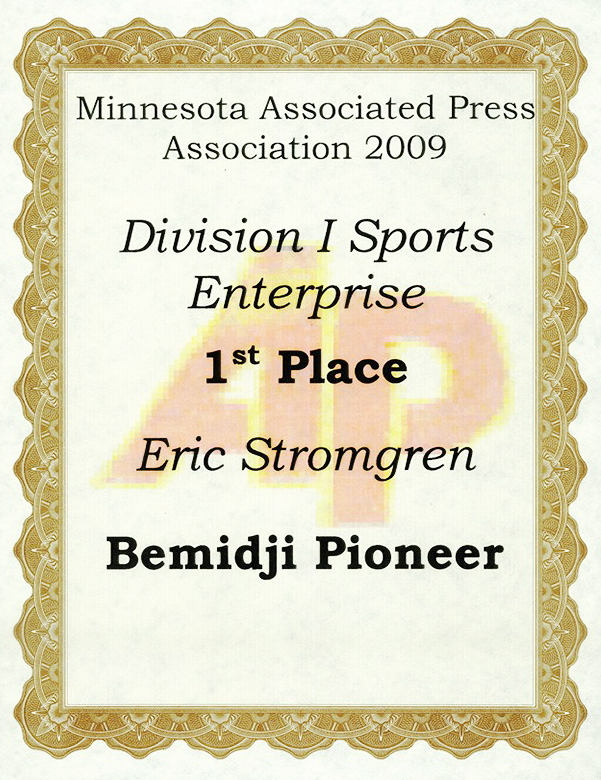 This is one of three individual journalism award certificates presented to me in 2009. 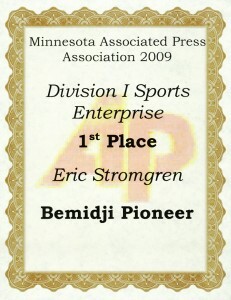 My professional background is rooted in print sports journalism. I have years of experience writing sports, news and web-based stories dating back to my first byline at the St. Cloud State college newspaper in 2003. I take pride in producing great journalism and my efforts have been recognized with many journalism excellence awards throughout my professional career. Multimedia Top 2 for the in-depth Legendary Ladies project (Mike Organ, Dave Ammenheuser and Eric Stromgren). Tennessean.com received Top 10 honors (500,000-1.9 million monthly users division). This marked the first time The Tennessean was recognized in the Top 10 by this organization. Finalist (Staff). I was the night digital content producer. Judge’s comments: For late-night coverage of a police officer who was shot and killed while responding to a “welfare check” at an apartment. Judges said: “St. Cloud did a fine job of jumping on a breaking news story late at night. The police officer was shot and killed shortly after 10 p.m. and St. Cloud’s night digital content producer dashed to the scene. He immediately began sending out Facebook and Twitter updates, followed by an online story, photos and video of a 3 a.m. press conference.